Cut horizontally down center length of pork to within 3/4 inch of opposite side. Open flat. From center, cut horizontally to within 3/4 inch from left side edge. Turn pork; repeat cutting to other side; open flat. If pork is thicker than 3/4 inch, cover pork with plastic wrap and pound until about 3/4-inch thickness. Remove plastic wrap. Mix mustard and butter. Spread half of mustard mixture on inside surfaces of pork. Mix stuffing and fruit; spread over mustard-coated surfaces. Roll roast; tie with kitchen twine. Spread remaining mustard mixture over outside of roast; rub with brown sugar. In 12-inch nonstick skillet, heat oil over medium-high heat. Cook pork in oil until brown on all sides. Place pork in 4 1/2- to 6-quart slow cooker. Pour apple juice into skillet; cook 2 to 3 minutes to dissolve any caramelized juices in bottom of skillet. Stir in salt and pepper; pour over pork. Cook on low heat setting 6 to 8 hours or until meat thermometer inserted into center of pork reads 160°F. 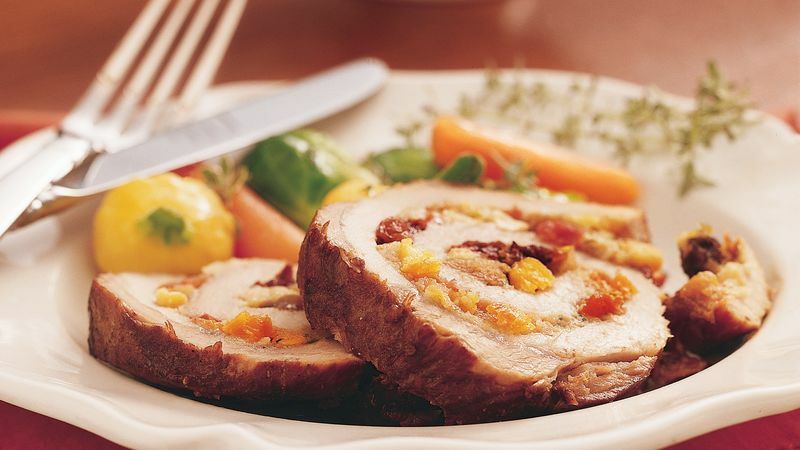 Ask your butcher to cut the pork roast to save you time.